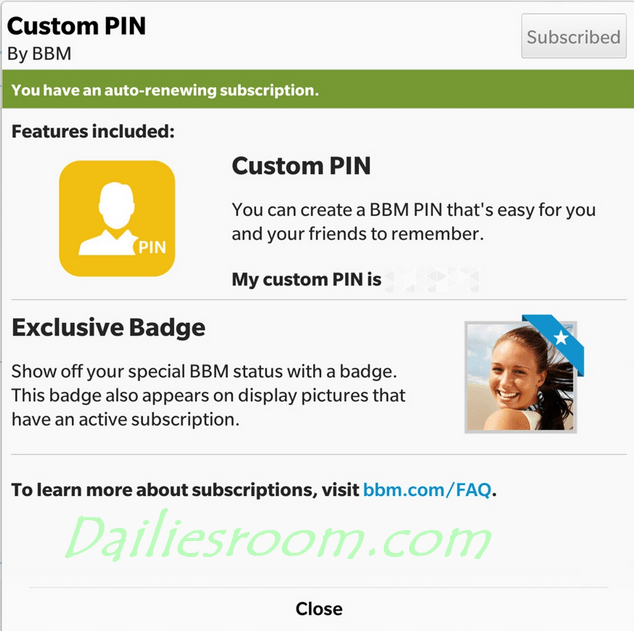 How to Create a BBM Custom PINs – The new BBM Custom PINs is to enable you create a friendly customized pin for you are your friends to always remember. Your existing and new contacts can add you to BBM using this Custom PIN, making adding new contacts easier than ever. From the look of things I found out that creating a BBM custom Pins is NOT for free. Make sure you are running the latest BBM software on your device. Once you subscribe following the steps below, you have the full right to choose your nickname, alias or even something totally out of the box! Customize your PIN to reflect who you are. Make it more easier by bookmarking our page www.dailiesroom.com, because we still have more interesting stuffs to show you “How To Do” your self. Also if you have any question, kindly use the comment box below to state them and your questions or doubt will be cleared to the fullness of your understanding.